Aerobic exercise (also known as cardio) is physical exercise of low to high intensity that depends primarily on the aerobic energy-generating process. 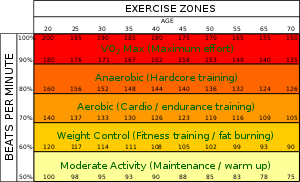 "Aerobic" means "relating to, involving, or requiring free oxygen", and refers to the use of oxygen to adequately meet energy demands during exercise via aerobic metabolism. Generally, light-to-moderate intensity activities that are sufficiently supported by aerobic metabolism can be performed for extended periods of time. What is generally called aerobic exercise might be better termed "solely aerobic", because it is designed to be low-intensity enough so that all carbohydrates are aerobically turned into energy. When practiced in this way, examples of cardiovascular or aerobic exercise are medium to long distance running or jogging, swimming, cycling, and walking. Aerobic exercise and fitness can be contrasted with anaerobic exercise, of which strength training and short-distance running are the most salient examples. The two types of exercise differ by the duration and intensity of muscular contractions involved, as well as by how energy is generated within the muscle. In almost all conditions, anaerobic exercise is accompanied by aerobic exercises because the less efficient anaerobic metabolism must supplement the aerobic system due to energy demands that exceed the aerobic system's capacity. Common kettlebell exercises combine aerobic and anaerobic aspects. Cooper himself defines aerobic exercise as the ability to use the maximum amount of oxygen during exhaustive work. Cooper describes some of the major health benefits of aerobic exercise, such as gaining more efficient lungs by maximizing breathing capacity, thereby increasing ability to ventilate more air in a shorter period of time. As breathing capacity increases, one is able to extract oxygen more quickly into the blood stream, increasing elimination of carbon dioxide. With aerobic exercise the heart becomes more efficient at functioning, and blood volume, hemoglobin and red blood cells increase, enhancing the ability of the body to transport oxygen from the lungs into the blood and muscles. Metabolism will change and enable consumption of more calories without putting on weight. Aerobic exercise can delay osteoporosis as there is an increase in muscle mass, a loss of fat and an increase in bone density. With these variables increasing, there is a decrease in likelihood of diabetes as muscles use sugars better than fat. One of the major benefits of aerobic exercise is that body weight may decrease slowly; it will only decrease at a rapid pace if there is a calorie restriction, therefore reducing obesity rates. Improving mental health, including reducing stress and lowering the incidence of depression, as well as increased cognitive capacity. Both the health benefits and the performance benefits, or "training effect", require that the duration and the frequency of exercise both exceed a certain minimum. Most authorities suggest at least twenty minutes performed at least three times per week. ^ a b Sharon A. Plowman; Denise L. Smith (1 June 2007). Exercise Physiology for Health, Fitness, and Performance. Lippincott Williams & Wilkins. p. 61. ISBN 978-0-7817-8406-1. Retrieved 13 October 2011. ^ Kenneth H. Cooper (1997). Can stress heal?. Thomas Nelson Inc. p. 40. ISBN 978-0-7852-8315-7. Retrieved 19 October 2011. ^ William D. McArdle; Frank I. Katch; Victor L. Katch (2006). Essentials of exercise physiology. Lippincott Williams & Wilkins. p. 204. ISBN 978-0-7817-4991-6. Retrieved 13 October 2011. ^ Bassett, D. R.; Howley, E. T. (1997). "Maximal oxygen uptake: "classical" versus "contemporary" viewpoints". Medicine and Science in Sports and Exercise. 29 (5): 591–603. ISSN 0195-9131. PMID 9140894. ^ "The Nobel Prize in Physiology or Medicine 1922". NobelPrize.org. Retrieved 2018-10-11. ^ Seiler, Stephen (2011). "A Brief History of Endurance Testing in Athletes" (PDF). SportScience. 15 (5). ^ "History of Exercise Physiology". Human Kinetics Europe. Retrieved 2018-10-11. ^ Fit Bodies. Fitness Culture and Gym Sassatelli, Roberta. 2006. ^ Stracher, Cameron. "Running on Empty: An American Sports Tradition Fades". Retrieved 2018-10-11. ^ Cooper, Kenneth H. (1983) . Aerobics (revised, reissue ed.). Bantam Books. ISBN 978-0553274479. ^ "(PDF) The Fitness Revolution. Historical Transformations in a Global Gym and Fitness Culture". ResearchGate. Retrieved 2018-10-07. ^ Stern, Marc (2008). "The Fitness Movement and the Fitness Center Industry, 1960-2000" (PDF). Business and Economic History On-line. Retrieved 2018-10-07. ^ Cooper, Kenneth H. (2010). "The Benefits Of Exercise In Promoting Long And Healthy Lives – My Observations". Methodist DeBakey Cardiovascular Journal. 6 (4): 10–12. doi:10.14797/mdcj-6-4-10. ^ "Aerobic exercise: the health benefits". myDr. 11 January 2010. Retrieved 17 May 2016. ^ "Cardiovascular fitness is linked to intelligence". 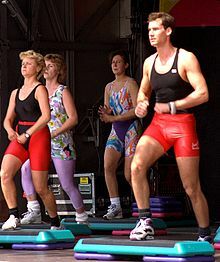 ^ 'aerobic exercise', Food and Fitness: A Dictionary of Diet and Exercise, Michael Kent, Oxford University Press, 1997.